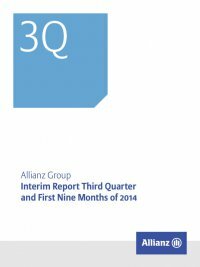 Interim Report Third Quarter and First Nine Months of 2014 Allianz Group30 Three-year rolling investment performance of ­­PIMCO and ­AllianzGI1 % PIMCO AllianzGI 12/31/2013 9/30/2014 12/31/2013 9/30/2014 100 80 60 40 20 0 (20) (40) 93 (7) 90 (10) 58 (42) 55 (45) Outperforming third-party assets under management Underperforming third-party assets under management 1 The investment performance is based on ­Allianz Asset Management account-based, asset-weighted three-year investment performance of third-party assets versus the primary target including all accounts managed by portfolio managers of ­Allianz Asset Management. For some retail funds, the net of fee performance is compared to the median performance of the corresponding Morningstar peer group (first and second quartile mean outperformance). For all other retail funds and for all institutional accounts, the gross of fee perfor­mance (revaluated based on closing prices) is compared to the respective benchmark based on different metrics. The overall three-year rolling investment performance of our Asset Management business remained on a high level, with 88 % of our assets outperforming their respective benchmarks (31 December 2013: 85 %). 93 % of PIMCO assets outperformed their respective bench- marks while 58 % of ­AllianzGI assets outperformed their respective benchmarks. Operating revenues 2014 to 2013 Third quarter comparison Operating revenues fell by € 85 MN, or 5.0 %, to € 1,618 MN. This was mainly driven by lower management and loading fees, but also reflects the allocation of certain entities to other business segments. On an internal basis1, operating revenues went down by 2.5 %. Net fee and commission income declined by € 81 MN, or 4.7 %, to € 1,617 MN. This largely reflects a decrease in management and load- ing fees, mainly driven by lower margins. Our performance fees decreased by € 2 MN to € 40 MN. 2014 to 2013 first Nine Months comparison Our operating revenues fell by € 687 MN, or 12.7 %, to € 4,742 MN. On an internal basis1, operating revenues went down 8.5 %. This was mainly the result of a € 270 MN decrease in performance fees – which were exceptionally high in the first quarter of 2013 – and lower average third-party assets under management. Operating profit 2014 to 2013 Third quarter comparison Our operating profit declined to € 694 MN, a contraction of € 61 MN, or 8.1 %, primarily due to lower management and loading fees. On an internal basis1, operating profit fell by 5.0 %. Administrativeexpenseswentdownby€ 25 MNto€ 925 MN,driven by lower personal expenses as well as lower assets under manage- ment related expenses. Our cost-income ratio went up by 1.4 percentage points mainly as a result of the reduction in management and loading fees. 2014 to 2013 first Nine Months comparison Our operating profit decreased by € 443 MN, or 18.0 %, to € 2,015 MN (internal growth1: (13.4) %) while the cost-income ratio rose by 2.8 per- centage points. The main drivers are as described in the first nine months comparison of the operating revenues. Net income In the third quarter of 2014, our net income decreased by € 44 MN, or 9.2 %, to € 438 MN. In the first nine months of 2014 our net income decreased by € 275 MN to € 1,263 MN. This is largely consistent with our operating profit development. 1 Operating revenues/operating profit adjusted for foreign currency translation and (de-) consolidation effects.